Not surprisingly, my recent article on “The Important Role Of Recessions” led to more than just a bit of debate on why “this time is different.” The running theme in the debate was that debt really isn’t an issue as long as our neighbors are willing to support continued fiscal largesse. As I have pointed out previously, the U.S. is currently running a nearly $1 Trillion dollar deficit during an economic expansion. This is completely contrary to the Keynesian economic theory. “Keynes contended that ‘a general glut would occur when aggregate demand for goods was insufficient, leading to an economic downturn resulting in losses of potential output due to unnecessarily high unemployment, which results from the defensive (or reactive) decisions of the producers.’ In other words, when there is a lack of demand from consumers due to high unemployment, the contraction in demand would force producers to take defensive actions to reduce output. In such a situation, Keynesian economics states that government policies could be used to increase aggregate demand, thus increasing economic activity, and reducing unemployment and deflation. Of course, with the government already running a massive deficit, and expected to issue another $1.5 Trillion in debt during the next fiscal year, the efficacy of “deficit spending” in terms of its impact to economic growth has been greatly marginalized. The main issue is that government spending has shifted away from productive investments which create jobs (infrastructure and development) to primarily social welfare and debt service which has a negative rate of return. 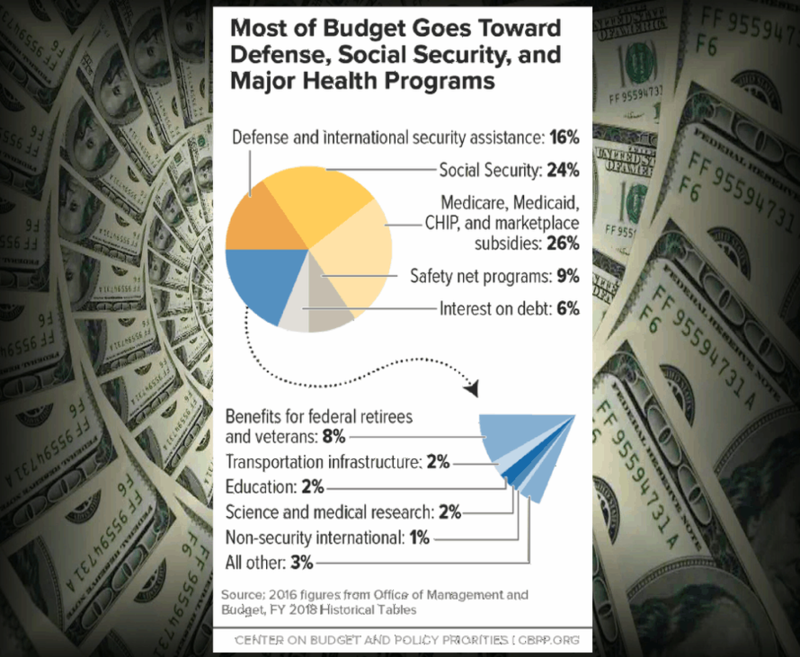 As I showed on Friday, according to the Center On Budget & Policy Priorities, nearly 75% of every tax dollar goes to non-productive spending. Through the second quarter of this year, the Federal Government has spent $4.45 Trillion which was equivalent to 24% of the nation’s entire GDP. Of that total spending, only $3.47 Trillion was financed by Federal revenues leaving $983 billion to be financed with debt. In other words, it took all of the revenue received by the Government just to cover social welfare and service interest on the debt. I am not saying that all debt is bad. However, these “sugar highs” are temporary in nature. 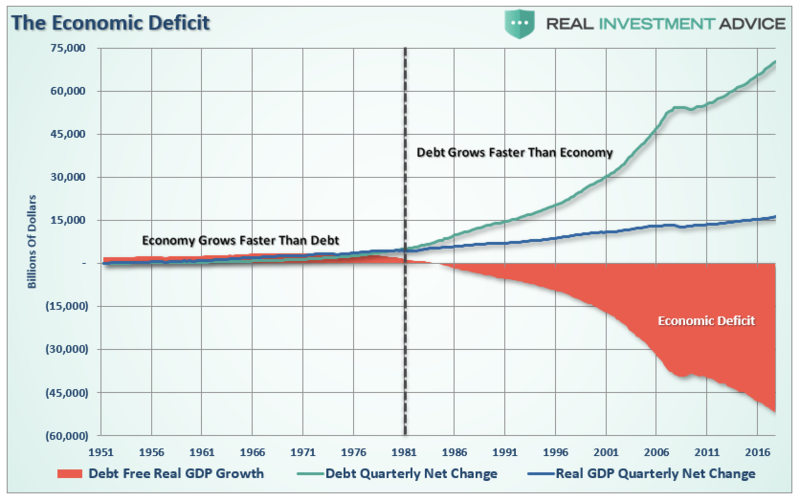 The problem is the massive surge in unbridled deficit spending which provides the temporary illusion of economic growth simply “pulls forward” future consumption leaving a void that must be filled. Since the bulk of the debt issued by the U.S. has been squandered on increases in social welfare programs and debt service, there is a negative return on investment. 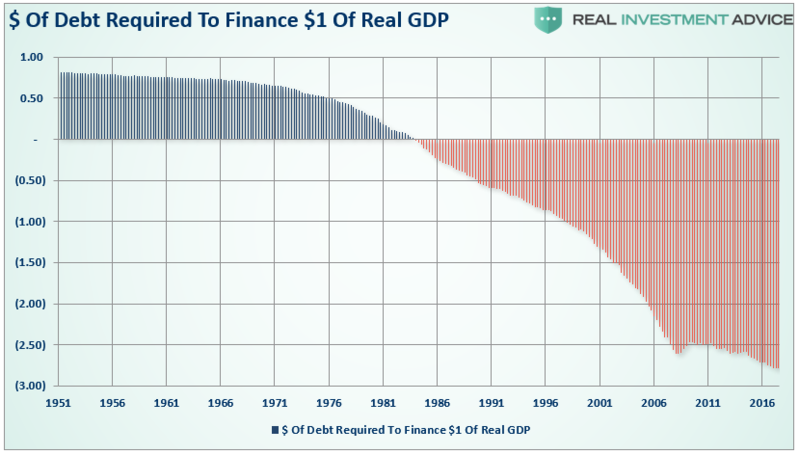 Therefore, the larger the balance of debt becomes, the more economically destructive it is by diverting an ever growing amount of dollars away from productive investments to service payments. 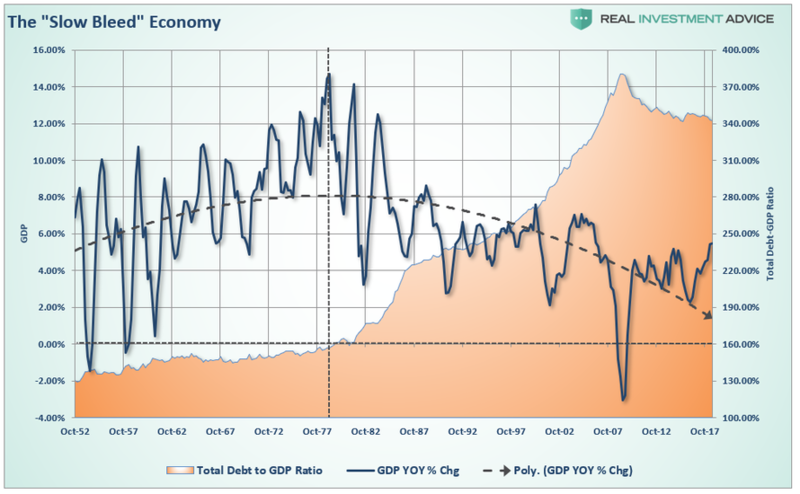 The relevance of debt growth versus economic growth is all too evident as shown below. 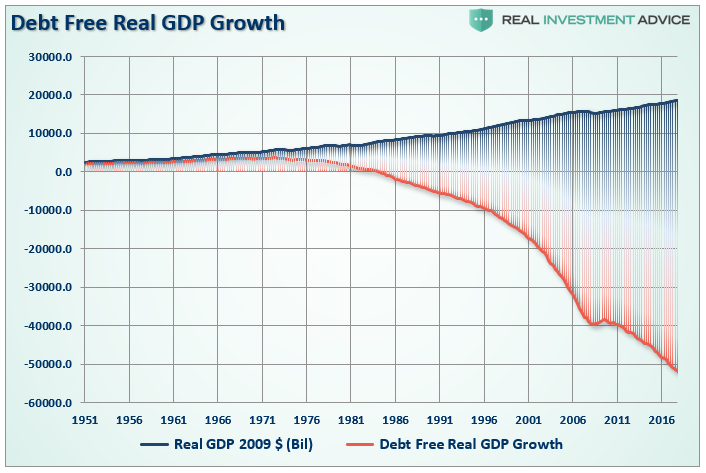 Since 1980, the overall increase in debt has surged to levels that currently usurp the entirety of economic growth. 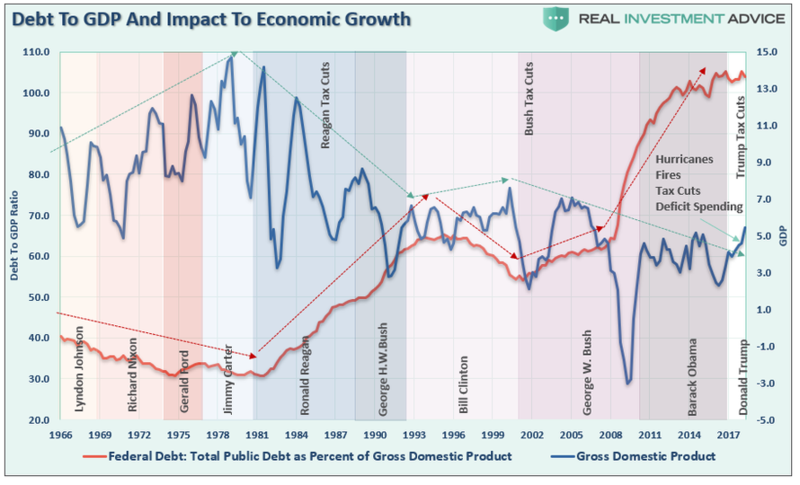 With economic growth rates now at the lowest levels on record, the growth in debt continues to divert more tax dollars away from productive investments into the service of debt and social welfare. But it isn’t just Federal debt that is the problem. It is all debt. When it comes to households, which are responsible for roughly 2/3rds of economic growth through personal consumption expenditures, debt was used to sustain a standard of living well beyond what income and wage growth could support. This worked out as long as the ability to leverage indebtedness was an option. The problem is that when rising interest rates hit a point where additional leverage becomes problematic, further economic cannot be achieved. 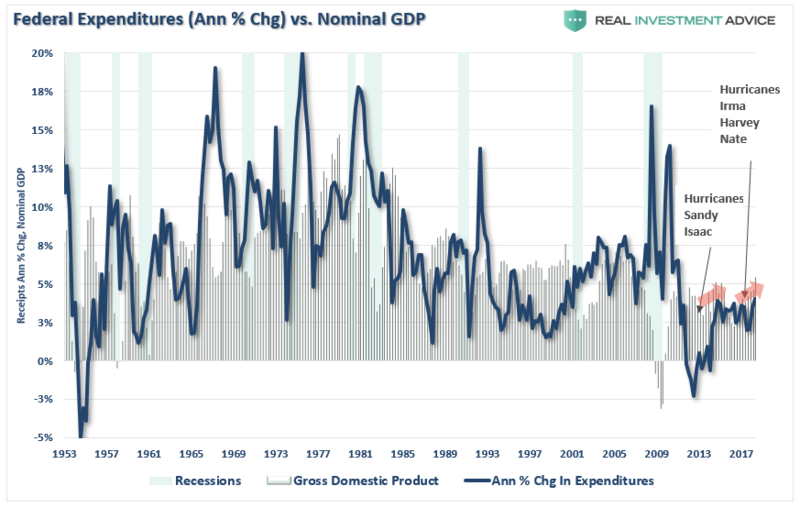 Given the massive increase in deficit spending by households to support consumption, the “bang point” between rates and the economy is likely closer than most believe. What was the difference between pre-1980 and post-1980? From 1950-1980, the economy grew at an annualized rate of 7.70%. This was accomplished with a total credit market debt to GDP ratio of less 160%. The CRITICAL factor to note is that economic growth was trending higher during this span going from roughly 5% to a peak of nearly 15%. There were a couple of reasons for this. First, lower levels of debt allowed for personal savings to remain robust which fueled productive investment in the economy. Secondly, the economy was focused primarily on production and manufacturing which has a high multiplier effect on the economy. This feat of growth also occurred in the face of steadily rising interest rates which peaked with economic expansion in 1980. The obvious problem is the ongoing decline in economic growth over the past 35 years has kept the average American struggling to maintain their standard of living. 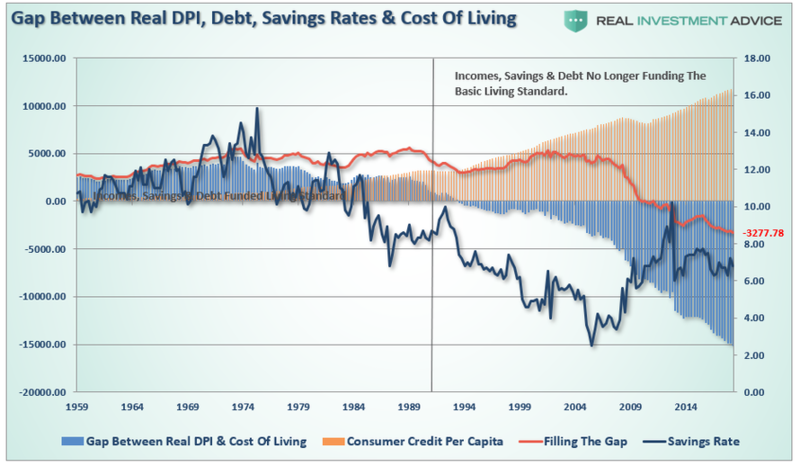 As real wage growth remains primarily stagnate, consumers are forced to turn to credit to fill the gap in maintaining their current standard of living. However, as more leverage is taken on, the more dollars are diverted from consumption to debt service thereby weighing on stronger rates of economic growth. I have shown this gap previously. The massive indulgence in debt has simply created a “credit-induced boom” which has now reached its inevitable conclusion. 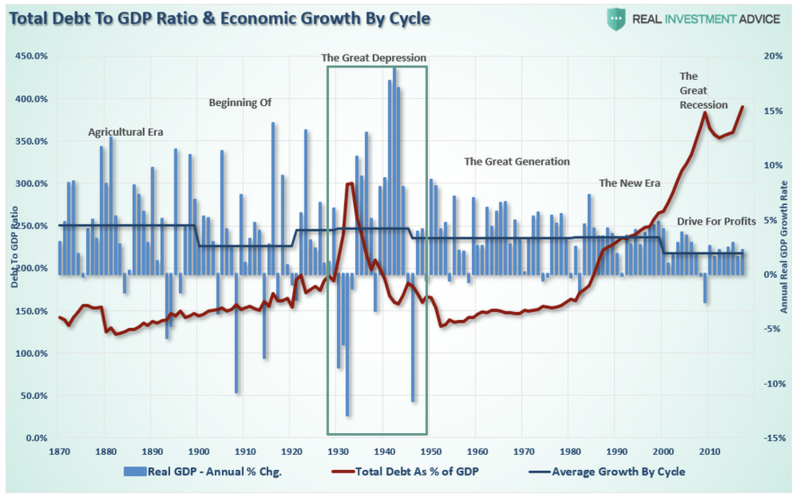 While the Federal Reserve believed that creating a “wealth effect” by suppressing interest rates to allow cheaper debt creation would repair the economic ills of the “Great Recession,” it only succeeded in creating an even bigger “debt bubble” a decade later. This unsustainable credit-sourced boom led to artificially stimulated borrowing which pushed money into diminishing investment opportunities and widespread mal-investments. In 2007, we clearly saw it play out “real-time” in everything from sub-prime mortgages to derivative instruments which were only for the purpose of milking the system of every potential penny regardless of the apparent underlying risk. Today, we see it again in accelerated stock buybacks, low-quality debt issuance, debt-funded dividends, and speculative investments. When credit creation can no longer be sustained, the markets must clear the excesses before the next cycle can begin. It is only then, and must be allowed to happen, can resources be reallocated back towards more efficient uses. This is why all the efforts of Keynesian policies to stimulate growth in the economy have ultimately failed.Those fiscal and monetary policies, from TARP and QE, to tax cuts, only delay the clearing process. Ultimately, that delay only deepens the process when it begins. The biggest risk in the coming recession is the potential depth of that clearing process. With the economy currently requiring roughly $3 of debt to create $1 of economic growth. 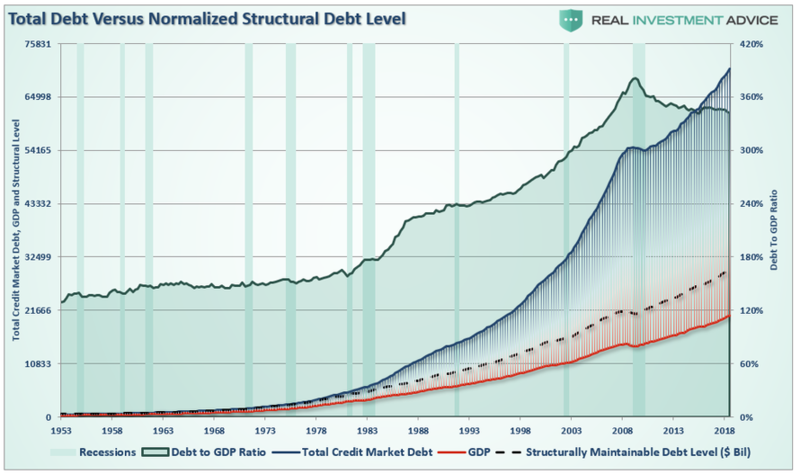 A reversion to a structurally manageable level of debt would involve a nearly $40 Trillion reduction of total credit market debt from current levels. This is one of the primary reasons why economic growth will continue to run at lower levels going into the future. We will witness an economy plagued by more frequent recessionary spats, lower equity market returns, and a stagflationary environment as wages remain suppressed while costs of living rise.